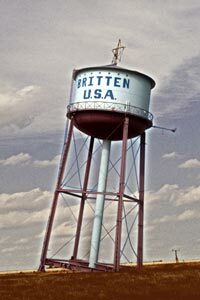 The Leaning Water Tower, an historic Route 66 site, was a gimmick of the once busy Britten Truck Stop. Though the business is long gone, its tower and the remains of its sign can still be seen today. Limitied Edition.